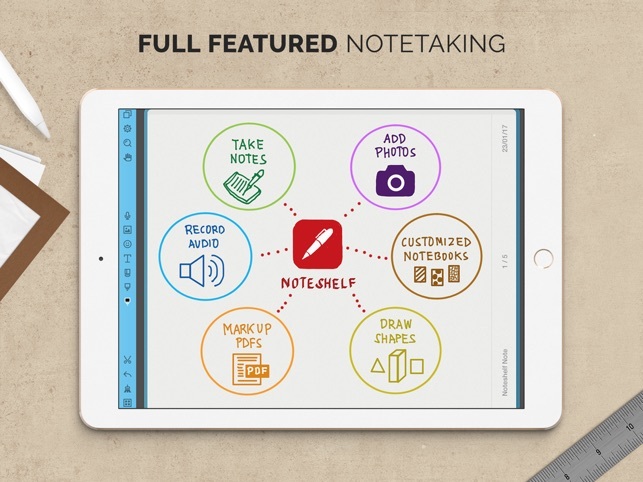 Noteshelf lets you take beautiful handwritten notes and annotate PDFs. You can also type your notes, record audio, draw shapes, sketch ideas, sign contracts, fill forms, print documents, and more right on your iPad. Syncs with Evernote and works with all popular cloud services such as Dropbox, Google Drive, and Box. Noteshelf offers the most beautiful handwriting on the app store - this is one of the key reasons why our users fall in love with Noteshelf. • Feel the fluidity and smoothness of our pens, pencils, and highlighters that rival the real ones. • Our unique ink pens produce a beautiful calligraphic effect that makes your handwriting look great. • Choose from a selection of 70 tastefully designed notebook covers, ranging from classic leathers to fun stripes and florals. • Turn the personalization a notch by changing your shelf themes to suit your choice of notebook covers. • Add a passcode to protect important and sensitive notes. • Tap on the "shapes tool" on the pen rack and see your pen strokes magically transform into shapes. • Draw perfectly geometrical shapes such as circles, triangles, squares, etc. to your notes. • Record lectures, meetings, and discussions while taking notes. • Playback recordings anytime you want. • Add multiple recordings and keep them safe right next to your notes. • Zoom into your notes for a more close-up and detailed writing. • Offers left-handed and other 5 more writing modes to meet everyone's writing style. 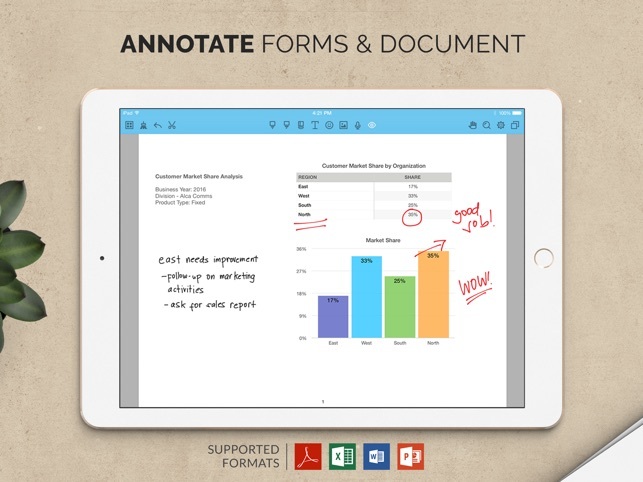 • Open-in and import PDF and Microsoft Office documents as notebooks in Noteshelf. • Sign and print contracts straight from your iPad. 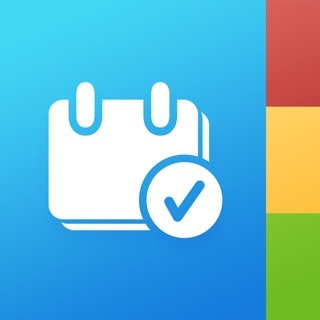 • Auto Publish all your notebooks one-way to Evernote and access them from any device. • Quickly share pages via Email, Twitter or Facebook. 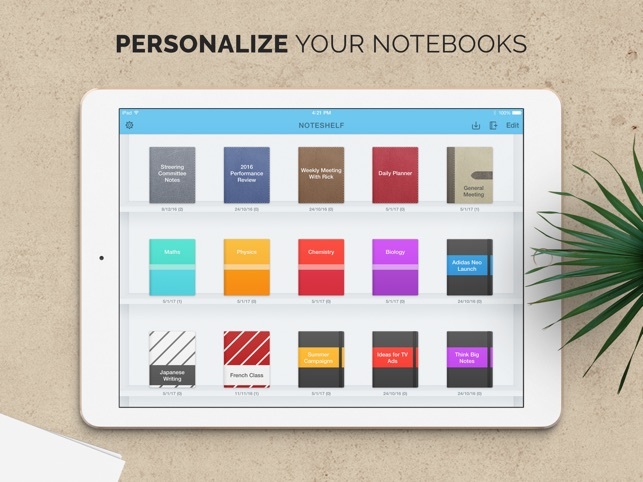 • Send your notes to Dropbox, Evernote, Google Drive for archival or sharing with classmates, colleagues or clients. • Showcase your lecture notes, diagrams, ideas & more using a projector. 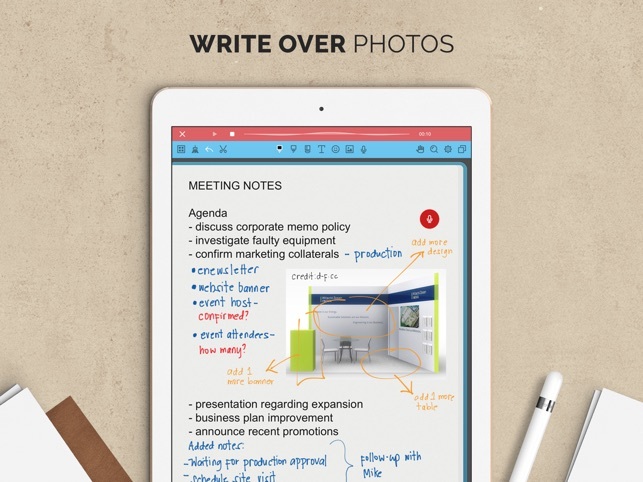 Noteshelf offers a special whiteboard mode for this purpose. 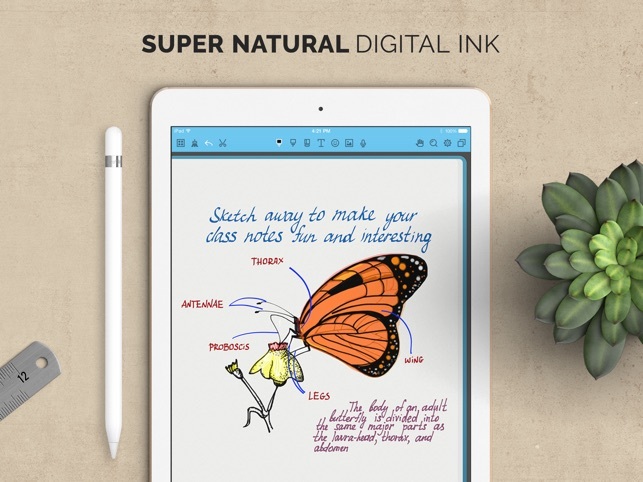 • Any iPad stylus will work great with Noteshelf. • Apple Pencil & Noteshelf are a match made in heaven. Let us know what you think. We’d love to hear from you! I love how realistic the writing utensils look! I have yet to find an app that beats the quality of this one. They have a wide range of colors to pick from and a very nice, easy to navigate UI. I always keep coming back to this app for everything. My main concerns are that the pages don’t feel like actual college ruled paper size. They feel a bit small. I also don’t like how you can’t just zoom in freely like you can in other apps. I wish they would also add an option of pre-made shapes you can just manipulate. I tend to have difficulty making that nice box because it is a bit hard to judge exactly where it will be once the lines are completely straightened out. I also wish they would auto-backup in a pdf format or something other than nbt format. I have tried accessing my notes from my DropBox since it has a feature that auto-backups, but I was not able to open my notebooks at all because currently there is no Mac software that can open and view nbt files. You can export pdf files of your notes, but I don’t want to do that every single time. I wish the auto-backup feature would allow you to pick which format you would like to backup in. Other than that I love this app. Every time I try to use another app and see if I like it any better, I always end up coming back to this one. I even started to use this more to ‘handwrite’ my notes instead of typing them. Love this app! 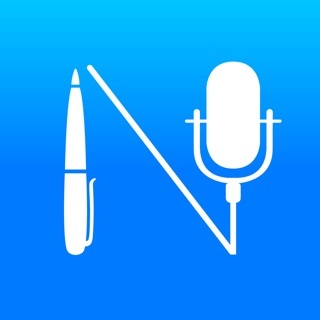 Better than all other note apps, especially with Apple Pencil. Unique to Noteshelf is the ability to create the look and feel of paper (I loved my paper and books) on shelf. I'm 100% paperfree home office now because of this app.i use a lot of different technology, so the only con is that I cannot use this on android/fire/PC and Mac.. the only two choices for that are Evernote (expensive and no shelf/notebook) or one note which doesn't easily switch between notebooks or have the "Feel" to replace notebooks/paper. In the future I would like to see multi platform expansion and creation of templates (would purchase) for business functions (i.e. Employee reviews/notes, client sales information sheets, etc). Another function no one has tried is a carousel of open books that one could hit a button and choose a open or recent notebook, rather than closing and going out to shelf to grab book. So, in concept this is a solid app....but a MAJOR flaw for me that has me really annoyed I just spent money on this. When you are writing in a notebook, you can not simply “Pinch” to zoom in and out. This is HUGE for me, so hoping if anyone else finds this feature necessary to avoid this app. It has a zoom feature, but it opens a smaller window at the bottom of the screen and is not intuitive to use. I have been using Notabilty and have LOVED it, but find organizing notes into files or folders not great - that, combined with syncing to Evernote lead me here...sorry it did. Just a few other comments: I do find a little “Lag” when writing, not huge but something I do not see in other Apps, I don’t like the in-app purchases (never do), just give me the notebook covers, I just spend $10 on your app. And the Sync to Evernote is nice...but it’s also another $1.99 for that ability. As I write, more about this the more I regret this journey...it may work for you, but right now this will sit in my apps list until I can find something useful to do with it....back to Notabilty I go (I do highly recommend - good workhorse app - Notabilty that is).